It's Thanksgiving, so happy Thanksgiving to everyone. We'll have a few less guests than last year but, on a positive note, that means we cook one turkey, not two. It's "have Thanksgiving with the other side of the family" for many of Pooteewheet's relatives. I don't think we'll get through all that gravy and I wonder if I have to regift my Uncle-in-law's corporate turkey (he works with me, we get a Thankgiving turkey for life if we retire) back to him. Maybe I'll just cook it in a few weeks and make him have lunch with me on the leftovers. It's been a little over a week now, but I'm 95% of the way to 40. Pooteewheet got me a very cool thermal coffeemaker a little early. I use the thing obsessively and have started making coffee to share at work every other week, which is easier now that half of it doesn't leak out the bottom of the coffeemaker and all over the white countertop. And I make coffee and just take the thermal pot with me to the rental property when I'm painting and cleaning and doing yardwork. It tends to stay hot and drinkable for about 24 hours. Almost on top of the change in age, but unrelated, I have a new job. She Says should take comfort in the fact that it's an internal move, not a job at a whole new company, and a lateral move, I poked around at promotion opportunities, but eventually picked the job where I thought I'd do the most good for the company (which includes making me happy, a happy Scooter is a very productive Scooter). I did have to do a lot of interviewing, but I had an advantage in that I have access to documentation and wikis and a willingness to absolutely consume information. It is a big change in that I won't be coding anymore except as a hobby (that's not a commitment to code CDFFL, Mean Mr. Mustard). Instead I'll be working with a variety of company groups to make sure they get the functionality they need. Sounds sort of project manager-ish when I put it that way, but that's not quite the truth of it - there's training and maybe some travel. Friends and family are invited to contact me about details if they're interested. 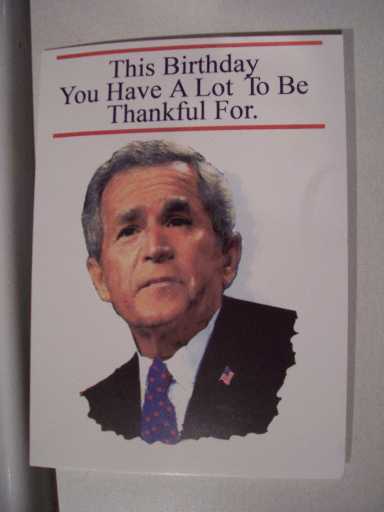 And I'd like to show you my favorite birthday card, which I got from Sandy, my old project lead. The punchline is, of course, "I can't run again." He he he You will always be fourd days older then me! Congrats all the way around! Does the new job involve travel (to conferences where you'll get swag, perhaps???) and/or a cubicle upgrade? Hope so! And you're right, you are younger than I am (if I did my math right)... by about 7 months.